Periodontal treatment with curettes and ultrasonic scalers may be associated with root surface removal, discomfort and pain. Air polishing devices have been seen as an alternative treatment. The main aim of this review was to analyse patient perception i.e. pain and discomfort during treatment, with air polishing devices in periodontal treatment. Searches were conducted in the Medline, Embase and Cochrane Library databases for controlled studies providing data on patient perception after instrumentation using air polishing devices. Two reviewers carried out screening of studies. Only studies in English and German were considered. Risk of bias was assessed using the Cochrane Collaboration tool and the Strengthening the Reporting of Observational studies in Epidemiology (STROBE) statement. Because of marked heterogeneity in setting parameters, spraying protocols and data analysis among the included studies a meta-analysis was not carried out. All 9 studies involved patient interviews with 5 of the studies also using a visual analogue scale (VAS). 2 types of air polishing device were used and 3 polishing powders, sodium bicarbonate, glycine or erythritol. VAS showed that glycine powder air polishing is perceived as significantly less uncomfortable or equally comfortable to treatment with ultrasonic devices. 8 adverse events in seven patients were described after subgingival treatment with glycine powder. Air polishing with powders consisting of glycine seems to be associated with less discomfort during non-surgical periodontal therapy, that is supra- and subgingival air polishing. While 3 databases were searched only English of German language studies were considered so it is possible that some studies may have bee missed a point noted by the authors in the discussion. Only a small number of studies are included involving a limited number of patients. None of the included studies as at low risk of bias and they suffer from marked heterogeneity. The authors consider that, evaluating the evidence overall using the SORT-Grading Taxonomy, that the A level for the strength of recommendation and level 1 for quality of evidence could be applied. Bühler J, Amato M, Weiger R, Walter C. A systematic review on the patient perception of periodontal treatment using air polishing devices. 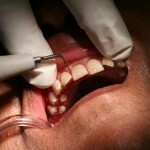 Int J Dent Hyg. 2015 Jan 23. doi: 10.1111/idh.12119. [Epub ahead of print] PubMed PMID: 25619863. Thanks for ur information !